The Curriculum Committee (Kerala State Education Department) has decided to make cosmetic changes to the Malayalam textbook in Social Science for the seventh standard and rewrite the English version. The Committee members who approved the English version earlier should resign from the committee for permitting the printing of such a textbook. If the committee members had bothered to read the book, they would not have sent it for printing not to speak of distribution to pupils. It is by interacting with the varied fields of society that we learn Social Science. This text is designed with this objective. We encounter very many issued in the immediate vicinity of life…. …. Let us proceed with bettering the activities grounded on your response and date collections, discourses, debates and analysis. We learn Social Science by interacting with the society and its varied activities. This textbook is designed to facilitate that. We come across many issues in our locality…. Well, if that is what he meant. As mentioned in earlier posts, the Malayalam version too is not free of deficiencies/errors of language and translation. However, the committee has not expressly announced a decision to correct them. It has also not decided to change the emphasis on violent side of the freedom struggle. 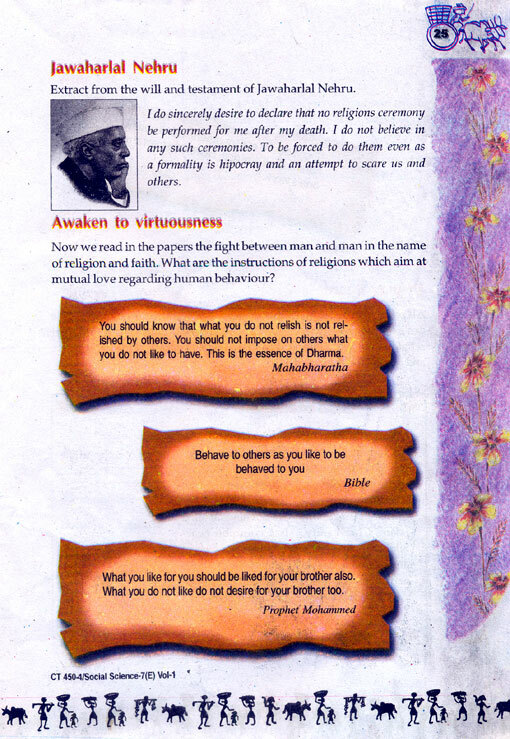 The textbook fails to highlight the non-violent character of the struggle led by Gandhiji. Besides, an attempt has been made to create a different impression by referring to Gandhi’s call to “do or die”. This ought to be corrected and the freedom struggle put in the correct perspective. The roof was not thatched for the last years and so it was not friendly with the wall. The family mix the previous day’s left over cooked rice with the rice soup they got form the landlord’s house and ate. Children used to quarrel while discussing how they should act when father plucked them and how they should cook and eat. At times they would have burning bites on the chilly. The far stretching farms and fields, swelling grounds and hill. As they enter what faces them is a litter of waste remains on plantain leaves spread on the floor. By bloodshed and intimidation, they started to rule and we were forced to become servants at orders. The exhortation words thrilled the agitators with vibrant enthusiasm. We have seen that the temperature received by the earth’s surface is not equal in all seasons. The rain occurs from the sky without any cost. The impact of the difference in the temporal and spatial distribution of rainfall is detrimental in nature. If we want to retain rainwater in the soil in Kerala which has an inclined relief, the overland flow should be restricted. The area encompassed between the place of origin of a river to the place where it is empties out is called the watershed. Attappadi is a place in Kerala which stands out from the other places because of its peculiarity in relief, climate, ecosystem and social advantages. The place is situated at an altitude between 450 m to 2300 m above the mean sea level. The latter two errors are serious since that would prevent pupils from understanding temperature and rainfall as measurement and quantity respectively. The text is full of errors of punctuation and capitalisation. Many words have been mispelled. Several of the headlines could have been improved. The printing quality is poor. The prose (above) does not qualify for teaching in any class if you value good English. The errors are marked in red ink. They include wrong construction of sentences and use of words besides errors of grammar and spelling. 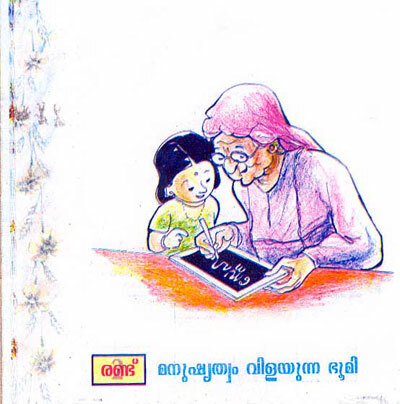 Carelessness is obvious: the panchayat’s name (in the Malayalam version, it is Nagalasseri) as well as the name of the book (Pokkuveyil) has been misspelled. Punctuation is incorrect both in the Malayalam and English versions. The following is the controversial portion from Lesson 2 of the textbook as appearing in the English version of the reader. Jeevan”s parents came to school seeking admission to him. The parents were seated on the chairs and the Headmaster started to fill up the application form. The headmaster looked at the parents and asked. The headmaster reclined in the chair and asked seriously. While the controversy over the Malayalam textbook in Social Science for Standard VII is raging, many seem to have ignored the English version of the textbook. It is meant to be taught in English medium schools that follow the State syllabus. The controversy over the political content apart, the book is not fit for teaching because of the sheer number of errors, wrong usages, poor style and erroneous quotes. 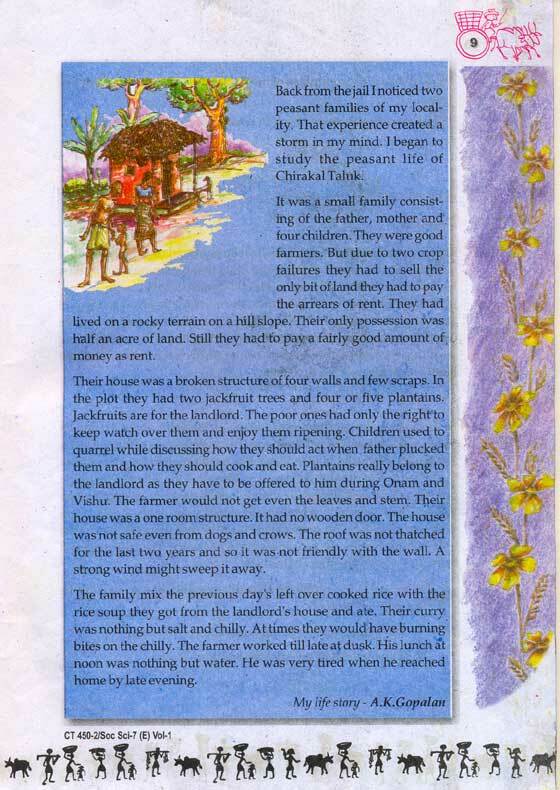 Many of the sentences in the English version are crude word-by-word translation of the text from Malayalam. The problem is compounded by the mistakes in the Malayalam text itself. Reports have already appeared in the Press about how the textbook distorted the will and testament of Jawaharlal Nehru. The original English was translated into Malayalam with two mistakes. Apparently, this was then translated back into English. The result is something that does not resemble Nehru’s elegant prose. The word delude became scare because of the erroneous Malayalam translation. The word ‘any‘ also had its roots in the Malayalam translation. The word (yathoru) was probably a deliberate addition to add emphasis. One should not behave towards others in a way that is disagreeable to oneself. This is the essence of dharma. Do not wish evil for anyone. Do not speak harshly to anyone. Do not obstruct anyone’s work. The Social Science textbook for the Seventh Standard (State Syllabus) has been in the eye of a storm for over a month now. The Christian and Muslim communities, the Opposition United Democratic Front (UDF) and even the BJP have made an issue of it. The accusation is that the textbook promotes atheism, communism and hatred against religions. Much of the criticisms against the textbook (on religious grounds) are exaggerated. The issue is being hyped up by the Opposition with an eye on the coming Parliament elections, as the fight in the State would be between the CPI (M) led Left Democratic Front and Congress led United Democratic Front. A lot of the criticism was centered on a lesson that presented a conversation between parent and headmaster of a school at the time of admission of their ward. The father asks the headmaster not to record his religion as his was a mixed marriage. The lesson emphases that the boy can chose a religion, if needed, when he grows up. There is nothing offending about this lesson. It could even be said to be in tune with the secular character of the country’s Constitution. However, the first lesson is in campaign mode, highlighting historic wrongs against the peasants and lower castes. The communist parties take the credit for the transformation that had been brought about in removing untouchability, feudalism and associated evils. Though the book also discusses freedom struggle, emphasis is on those who fought violently for the country s freedom. In this process, Mahatma Gandhi and his non-violent agitations did not get adequate emphasis. Jawaharlal Nehru gets better attention possibly because of his socialist leanings. The graphic narration of the practices associated with untouchability would embarrass Hindus more than Christians and Muslims. But it is the latter who are in the forefront of the agitation against the textbook. This has something to do with the strained relations between the communities and the Government over government’s efforts to regulate admissions and fee structure in self-financing colleges. The basic problem with the subject dealt with by the textbook is that it is recent history. It is debatable whether current history should be taught in the seventh standard. 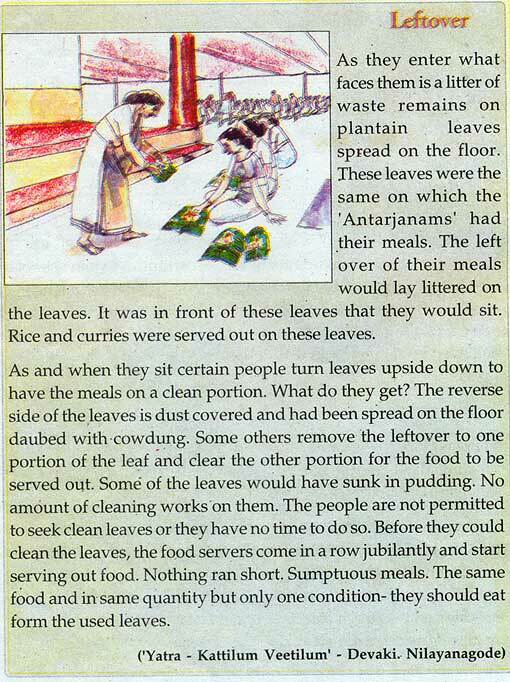 It is a must that students should know about untouchability and other evils that existed in the near past. (Many in the new generation think that reservation is unjust because they do not know about what had happened in the past.) But imparting of recent history could perhaps wait up to the higher secondary level, especially when class level discussions and conclusions are emphasised. Teacher’s skill as well as his prejudices can play positive and negative roles when lessons are interpreted. It is better not to leave much to subjective interpretation of upper primary teachers who are not scholars. There is little doubt that the standard of the textbook is poor. There are several mistakes too. Its English version for the English medium classes is full of wrong usages, spelling mistakes and errors.